Remote execution is the ability to issue R commands from either Machine Learning Server (or R Server) or R Client to a remote session running on another Machine Learning Server instance. You can use remote execution to offload heavy processing on server and test your work. It is especially useful while developing and testing your analytics. From code that calls the APIs. You can enter 'R' code just as you would in a local R console. R code entered at the remote command line executes on the remote server. The R functions used for remote execution are provided in the mrsdeploy package, which is installed with Machine Learning Server on almost every platform. Your administrator must configure the server for the deployment and consumption of analytics** before you can use the functions in the package. Read the article "mrsdeploy functions" for the list of remote execution functions in that package. To create a remote session, you must first authenticate with Machine Learning Server using one of the mrsdeploy login functions: remoteLogin() and remoteLoginAAD(). With these functions, you can authenticate, set the arguments to create a remote R session on the Machine Learning Server (session = TRUE) and even place yourself in the remote command line upon login commandline = TRUE. Read the article "Connecting to Machine Learning Server with mrsdeploy" for more on authentication with mrsdeploy and syntax. After you log in to the remote R server with the argument session = TRUE, a remote R session is created. 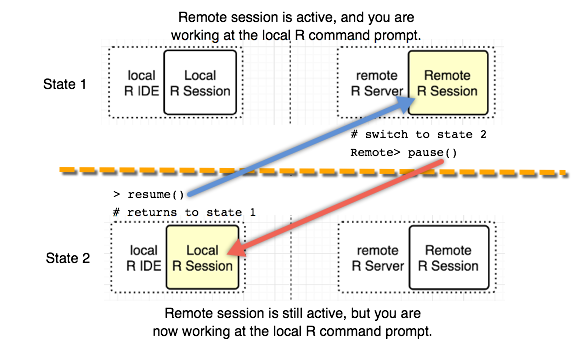 You can switch between the remote R session and the local R session directly from the command line. The remote command line allows you to directly interact with an R Server 9.x instance on another machine. pause() When executed from the remote R session, returns the user to the local > command prompt. resume() When executed from the local R session, returns the user to the REMOTE> command prompt, and sets a remote execution context. The differences between R package versions. This report appears whenever you log in, and you can also get the report using the diffLocalRemote() function. If you have R scripts on your local machine, you can execute them remotely by using the function remoteScript(). This function takes a path to an R script to be executed remotely. You also have options to save or display any plots that might have been generated during script execution. The function returns a list containing the status of the execution (success/failure), the console output generated, and a list of files created. If you need more granular control of a remote execution scenario, use the remoteExecute() function. If your R script has R package dependencies, those packages must be installed on the Microsoft R Server. Your administrator can install them globally on the server or you can install them yourself for the duration of your remote session using the install.packages() function. Leave the lib parameter empty. Certain functions are masked from execution, such as 'help', 'browser', 'q' and 'quit'. In a remote context, you cannot display vignettes or get help at your command-line prompt. In most cases, “system” commands work. However, system commands that write to stdout/stderr may not display their output nor wait until the entire system command has completed before displaying output. install.packages is the only exception for which we explicitly handle stdout and stderr in a remote context. To continue working in your development environment during the remote script execution, you can execute your R script asynchronously. Asynchronous script execution is useful when you are running scripts that have long execution times. To execute an R script asynchronously, set the async parameter for remoteScript() to TRUE. When remoteScript() is executed, the script is run asynchronously in a new remote R console window. All R console output and any plots from that execution are returned to the same window. After you have executed an R code remotely, you may want to retrieve certain R objects and load them into your local R session. For example, if you have an R script that creates a linear model m<-lm(x~y), use the function getRemoteObject() to retrieve the object m in your local R session. Conversely, if you have a local R object that you want to make available to your remote R session, you can use the function putLocalObject(). If you want to sync your local and remote workspaces, the functions putLocalWorkspace() and getRemoteWorkspace() can be used. Similar capabilities are available for files that need to be moved between the local and remote R sessions. The following functions are available for working with files: putLocalFile(), getRemoteFile(), listRemoteFiles() and deleteRemoteFile(). When you plot remotely, the default plot size is 400 x 400 pixels. If you desire higher-resolution output, you must tell the remote session the size of plot to create. Session snapshot functions are useful for remote execution scenarios. It can save the whole workspace and working directory so that you can pick up from exactly where you left last time. Think of it as similar to saving and loading a game. A session snapshot can be loaded into any subsequent remote R session for the user who created it. For example, suppose you want to execute a script that needs three R packages, a reference data file, and a model object. Instead of loading the data file and object each time you want to execute the script, create a session snapshot of an R session containing them. Then, you can save time later by retrieving this snapshot using its ID to get the session contents exactly as they were at the time the snapshot was created. However, any necessary packages must be reloaded as described in the next section. Snapshots are only accessible to the user who creates them and cannot be shared across users. listSnapshots(), createSnapshot(), loadSnapshot(), downloadSnapshot(), and deleteSnapshot(). While you can use snapshots when publishing a web service for environment dependencies, it can have an impact on performance at consumption time. For optimal performance, consider the size of the snapshot carefully especially when publishing a service. Before creating a snapshot, ensure that you keep only those workspace objects you need and purge the rest. And, if you only need a single object, consider passing that object alone itself instead of using a snapshot. After you understand the mechanics of remote execution, consider incorporating web service capabilities. You can publish an R web service composed of arbitrary R code block that runs on the remote R Server. For more information on publishing services, begin with the Working with web services in R guide. Publish from your local session: At the REMOTE> prompt, use pause() to return the R command line in your local session. Then, publish your service. Use resume() from your local prompt to return to the command line in the remote R session. Authenticate again from within the remote session to enable connections from that remote session to the web node API. At the REMOTE> prompt, authenticate with remoteLogin() or remoteLoginAAD(). However, explicitly set the argument session = FALSE this time so that a second remote session is NOT created and provide your username and password directly in the function. When attempting to log in from a remote session, you are not prompted for user credentials. Instead, pass valid values for username and password to this function. Then, you are authenticated and able to publish from the REMOTE> prompt. If you try to publish a web service from the remote R session without authenticating from that session, you get a message such as Error in curl::curl_fetch_memory(uri, handle = h) : URL using bad/illegal format or missing URL. Learn more about authenticating with remoteLogin() or remoteLoginAAD() in this article "Logging in to R Server with mrsdeploy."